When fighting cellulite, some people become so involved in just trying to achieve smooth body contours and curves, that other aspects of having a great body fall by the wayside. One of the problems with cellulite is that it also influences the quality of the skin, and skin elasticity is curtailed, which leads to an unhealthy looking skin. With Cellumend we look at removing the cellulite and to achieve smooth body contours and curves, yet at the same time we formulated the cream in such a way that skin elasticity and tone is also improved. As the manufacturers of Cellumend we strive to manufacture and supply effective products. The effectiveness of Cellumend was also clinically tested for the increase of skin elasticity during treatment. 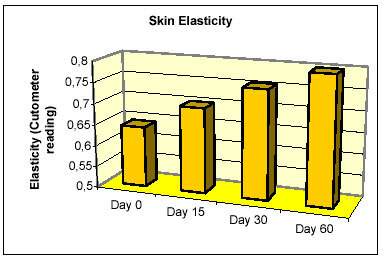 The skin elasticity was tested by means of a cutometer and it was found that an average increase of 17.5% elasticity was achieved after 30 days, and an average increase of 24.4% after the 60 day testing period. We believe in treating problems holistically, and with this in mind we have created a whole section of FREE information on how to fight already formed cellulite and how to prevent cellulite from forming. The Cellumend cream is the most effective way to fight cellulite, but following the principles outlined in our FREE information section will help you to achieve your desired results far quicker.